Make fall colors another reason to move to Lake Oswego. As Lake Oswego residents we live in a city that is celebrating its 29th year as a Tree City USA honoree and its designation as the Oregon Tree City of the year. And we are only 12 miles away from Portland which was voted by the American Forests organization as one of the 10 best cities for urban forest in the United States. So you would think that to view fall colors we wouldn’t have to travel very far, right? Right. While hiking the Deschutes River Trail or visiting Lithia Park in Ashland will also help you get your fall color fix, you can also stay close to home for a DIY fall foliage tour. 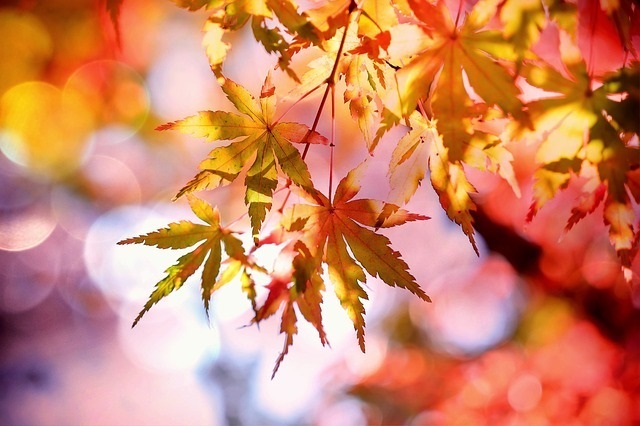 Although we are officially into fall, you’ll want to wait a couple weeks before you go leaf peeping to give those cold nights a chance to work their magic. Bike tour of Heritage Trees of Lake Oswego. Download this map of a 14 mile loop through Lake Oswego neighborhoods where many of the city’s heritage trees stand in all their majestic splendor. Most of the 37 listed trees are evergreens; however, you won’t want to miss the show-stopping sugar maple on the corner of 3rd and C. Other ones to check out include the scarlet oak at 15100 Boones Ferry Road and the Pacific dogwood in the Oswego Pioneer Cemetery. Along the way you’ll catch some other beauties as well. Kruse Way. If you need a daily dose of fall color pick-me-up, just turn down Kruse Way off Boones Ferry Road and applaud the starring lineup of maples that will drench you in shades of orange, red and yellow. Or catch the dazzling row on Jean Road between Pilkington and Bryant. Stop in at Happy Sparrow Cafe and try out a kolache. Reed College and surrounding neighborhood. You’ll find 11 different varieties of maples on the Reed College campus bursting in shades of yellow, gold and copper. Look for Japanese maples throughout as well. Then stroll down some of the neighborhood streets. The tree canopy here is extensive with neighbors getting their cardio workouts just by raking up their leaves in preparation for their scheduled Leaf Removal Day. South Park Blocks. According to a Portland State University study, the trees that stretch along the 12 blocks from SW Salmon to Jackson are worth $3.4 million. The arching canopy includes oaks, maples, ash, lindens and elms so you’ll be awash in color. Hoyt Arboretum. Called Portland’s “museum of living trees” you’ll find 12 miles of trails to wander in. If you’re on the hunt for fall colors, your best bet is the Wildwood Trail bursting with shades of scarlet, maroon and plum or the one mile Maple Trail where you’ll find vine, red and sugar maple trees. 4000 SW Fairview Blvd., 503.865.8733. Portland Japanese Garden. There are special hours on October 22 for Photography Members to capture the fall foliage here so it must be Instagram-worthy. You don’t have to wait until then. There is an admission charge that gives you access to the gardens, Cultural Village, Art in the Garden and the Umani Café. Lone Fir Cemetery. With more than 700 trees, Portland’s oldest cemetery is also its second largest arboretum that really puts on a show in the fall. Combine a little history with your leaf peeping as you locate the plots of some of the area’s founders with the names of Lovejoy and Hawthorne. Downloadable cemetery and tree tour maps will help. Southeast 26th and Washington Streets. Get the most out of living in Lake Oswego by subscribing to my blog. Click the “Sign me up” button in the top right hand column. And if you’re thinking of moving to Lake Oswego, subscribe so you can see why buying a home in Lake Oswego just might be the best decision you’ll ever make! This entry was posted in Seasons in Lake Oswego and tagged fall colors, Lake Oswego Oregon, Lake Oswego Realtor. Bookmark the permalink.